Michael O'Brien presents a thrilling apocalyptic novel about the condition of the Roman Catholic Church at the end of time. It explores the state of the modern world, and the strengths and weaknesses of the contemporary religious scene, by taking his central character, Father Elijah Schäfer, a Carmelite priest, on a secret mission for the Vatican which embroils him in a series of crises and subterfuges affecting the ultimate destiny of the Church. Father Elijah is a convert from Judaism, a survivor of the Holocaust, a man once powerful in Israel. For twenty years he has been "buried in the dark night of Carmel" on the mountain of the prophet Elijah. The Pope and the Cardinal Secretary of State call him out of obscurity and give him a task of the highest sensitivity: to penetrate into the inner circles of a man whom they believe may be the Antichrist. Their purpose: to call the Man of Sin to repentance, and thus to postpone the great tribulation long enough to preach the Gospel to the whole world. In this richly textured tale, Father Elijah crosses Europe and the Middle East, moves through the echelons of world power, meets saints and sinners, presidents, judges, mystics, embattled Catholic journalists, faithful priests and a conspiracy of traitors within the very House of God. This is an apocalypse in the old literary sense, but one that was written in the light of Christian revelation. "I've read thousands of books, and this is one of the great ones. I hope tens of thousands read it, and are shaken as I have been. It's a novel that grips one like a thriller -- indeed it is a thriller, but also something far deeper. There are love and friendship, interwoven with drama, but what it is essentially is faith, faith in the Christ." 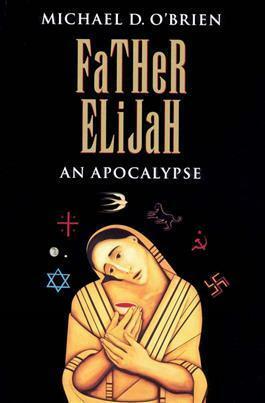 "Father Elijah is that rare thing, a great novel which is also a testimony to orthodox Catholicism. But it is more even than this. Basing himself squarely on Scripture and human experience, O'Brien has produced a prophetic work and a manual of spiritual warfare. This compelling masterpiece will stretch your imagination in the right direction. Read it and pray." "I guarantee you that once you take up this book you will not put it down until the end of the world. Here is a meaty page-turner with the pace of a thriller, beautifully written, and that something more that turns entertainment into literature." "… offers up a tale that is satirical, sly, and fast-paced." "A joy to read. Smoothly crafted, the characters came to life for me. It is a classic story, told in an inspired, inspirational way … wonderfully uplifting." Michael D. O'Brien, iconographer, painter, and writer, is the popular author of many best-selling novels including Father Elijah, Elijah in Jerusalem, The Father's Tale, Eclipse of the Sun, Sophia House, Theophilos, and Island of the World. His novels have been translated into twelve languages and widely reviewed in both secular and religious media in North America and Europe.